When Microsoft introduced Windows Phone 7, users had to work with the company's Zune software to sync their media files. These days, however, the Zune software is discontinued (though it’s still available for people with Windows Phone 7 devices), and Windows Phone 8 is a whole new ballgame. 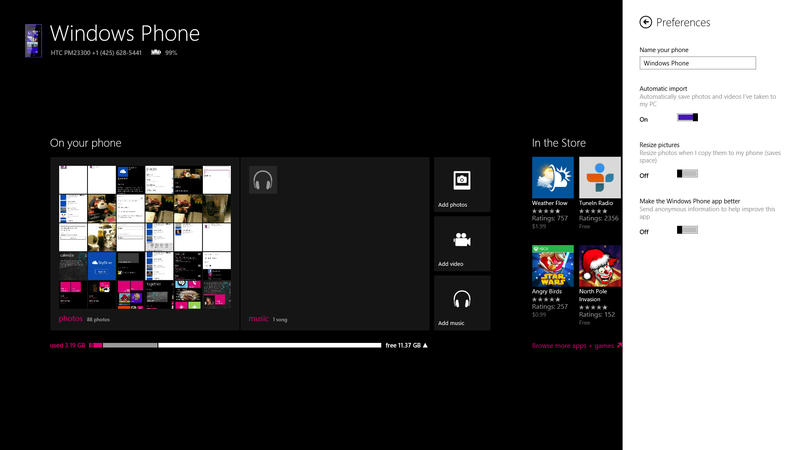 Windows Phone 8 users have a new tool for syncing: the Windows Phone app for Windows 8 and Windows RT. The only issue with the app, of course, is that it’s exclusively for PCs with Windows 8 or Windows RT installed. If your PC has Windows 7 (or even XP or Vista), you can still add files to your Windows Phone 8 handset through a simple drag-and-drop method; it’s not the slickest approach, but it is quick and easy. And if you happen to have a Windows 8 or RT machine, you can use the new Windows Phone app from the Windows Store—or use the drag-and-drop method. We break down both ways below. If your computer runs Windows 7 or earlier, you can’t use the new Windows Phone app for Windows 8 and RT. Luckily, adding music, photos, documents, and videos to your Windows Phone 8 device remains pretty simple. First, plug your phone into your computer using a USB cable. Open Computer and locate your Windows Phone 8 device, which should appear under 'Portable Devices'. Double-click the Windows Phone 8 icon to open your device. You will see a drive icon called Phone; double-click this icon to open it. Now you’ll see five folders: Documents, Music, Pictures, Ringtones, and Videos. To add files to your device, simply locate the files on your PC and then drag them into the appropriate Phone folder. 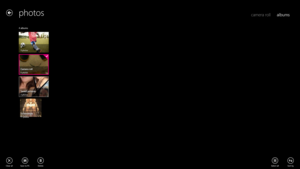 For example, if you wish to add a song to your Windows Phone 8 handset, find the song on your computer (using Explorer) and drag it into the Music folder. You can also reverse this process: If you want to add a file from your phone to your computer, you can open the appropriate Phone folder, find the file, and copy it to your computer by dragging it to the location where you'd like to keep the file. If you're rocking a system with Windows 8 or Windows RT installed, then you can sync media to your Windows Phone 8 device through the Windows Phone app. It's just as easy as syncing with older versions of Windows, but you have several additional features and options. 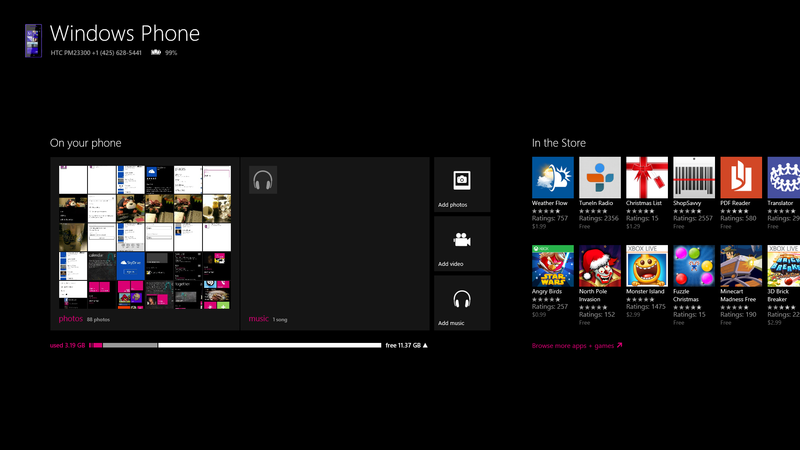 First you need to download the Windows Phone app from the Windows Store; the app is free. Once you’ve downloaded the app, tap or click it to open it. You’ll see a prompt to plug in your Windows Phone 8 device with a USB cable, and then the app will ask you to name your device (you can change this name later in the settings panel, so don't worry about picking the perfect one on the spot). After you’ve set up your Windows Phone 8 device on the Windows Phone app, you will see three panels: 'On your phone', which shows the media already stored on your handset; 'In the store', which shows apps that you can download from the Windows Phone Store; and 'On the web', which has links to Windows Phone-related sites offering services such as 'Find a lost phone' and 'See your account'. We’re interested in the first panel, 'On your phone'. Here, you can see the media items that already live on your phone. Three buttons on the right side of the panel allow you to add photos, videos, and music from your PC to your phone. 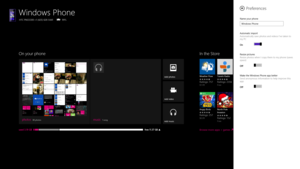 To copy media from your PC to your Windows Phone 8 device, tap one of the buttons. You can add folders or individual files by right-clicking the items you want to copy and tapping the Add button in the lower-right corner of the screen. If your desired folder or file doesn't reside within the Pictures, Music, or Video folders, you can add files from another folder by tapping Files > Add more… From here you can access all of your folders, including your SkyDrive account. You can also set up the Windows Phone app to sync your phone’s photos and videos with your PC automatically. Go to Settings > Preferences and turn on Automatic import. Now, whenever you connect your phone to your PC, the photos and videos that you’ve taken with your phone will sync to your computer. To copy media from your phone to your PC, tap the right-side panel again. If your files are in folders, you’ll see a screen that shows those folders. To move an entire folder to your PC, right-click the folder to select it (you can select multiple folders at once), and options will appear along the bottom of the screen. At this point you can tap Save to PC (or you can delete the files). You can also copy individual files from your phone to your PC by opening a folder, right-clicking to select the individual files to copy, and tapping Save to PC. Your files will be copied into a folder called 'From Windows Phone' (you cannot change this from within the Windows Phone app).